Disguises aren't limited to just facial structure. Kaito managed to disguise as a kid (ofcourse just "kind of" but he still showed that it's possible to fool the cast like that) and Vermouth has those air things on her that can make her body look like Araide's. wrd wrote: The name in the anime version is 中谷 正晃. To me, the surname in the anime version rather looks like 中方, which could be pronounced Nakakata. I changed the picture to grayscale and adjusted the brightness level to make it clearer, then I colored each part of the Kanji. Hope you see it being 谷 now. The little triangle-like thing at the bottom is actually 口 as it's written fast and pictured with a bad resolution. As I'm Chinese, identifying such handwriting Kanji is actually not a problem. The family name 中谷 (Hiragana:なかたに) is pronounced as Nakatani. If the TV producers had changed such a Kanji from the manga when they did the TV anime, I would think there should be a certain reason that we may look into. Yet it seems that they kept it the original. I was going for 平 as the first kanji in the surname,...but seems like it wasn't it. 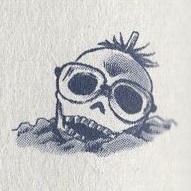 Maybe the anime staff took liberty with the first kanji since it was covered with the bubble speech in the manga..but then again one would think that they asked about it seeing how they kept most of the names on the page Heiji was looking at as they were in the manga ..but whatever. I just got an random idea... About Rei. 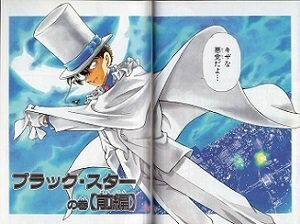 In an interview Gosho has stated that he actually has brown hair and it's significant. And I remember people speculating British ties for him. So what if... What if he was Elena's son? From before Atsushi? Like there was Elena and Rei, and then there was Atsushi and Akemi. Marriage happened and organization. Maybe Elena was already in Organization. And later Shiho was born. and then the lab explosion that killed the Miyano couple. Or something? Crazy right, but I really wanted to write this one up. 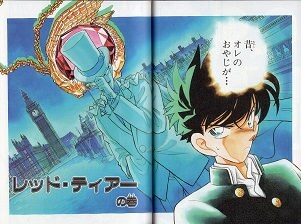 MoonRaven wrote: In an interview Gosho has stated that he actually has brown hair and it's significant. What if he was Elena's son? From before Atsushi? . Then wouldn't his explanation to the person he thought was Shiho during the Mystery Train case have gone a bit different? "As expected of "Hell Angel" 's daughter" and "I have met your parents"
I don't understand Japanese so I don't know what that piece of interview says. But I am aware of what Tooru said to Shiho. Maybe since he has never met her properly before, he keeps his distance and acts 'professionally'. That wasn't really a time to tell 'hey, I'm your half-brother btw'. MoonRaven wrote: I don't understand Japanese so I don't know what that piece of interview says. But I am aware of what Tooru said to Shiho. Maybe since he has never met her properly before, he keeps his distance and acts 'professionally'. That wasn't really a time to tell 'hey, I'm your half-brother btw'. "Amuro's dark skin color has a meaning.... Gosho declined to say whether Amuro's hair and skin color is natural, but mentioned his current hair color is supposed to be brown, not white." I guess his hair was, in fact, brown, when he was drawn on the Volume 76 character keyhole, and pretty much everyone misinterpreted it. I suppose the meaning of his skin color relates to one parent (this would be his father, if Elena is his mother, as you theorize) or both parents. Beyond that, I can't really think of what it could mean.
" 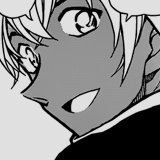 Q: Amuro-san’s white hair… is that dyed? Rather than white it’s brown. His dark skin too, there is a profound meaning behind it. (laughs) "
maybe he gave in to the hair color over the last two years? If anything, the blond hair makes him a more unique character... even more than he already is. After all, most characters have black or brown hair (or even red hair) and aren't dark-skinned. Blond/Blonde hair colors seem to be reserved for westerners. Thus, that gives him more of a link to the west than the dark skin (a more obvious link, that is). 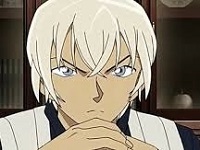 Your theory isn't impossible , his conversation with haibara alone can't be considered a proof to destroy this theory completely because simply can be explained as she doesn't know maybe no one knows amuro is older than haibara enough and probably in his flashback with elena haibara wasn't born yet . 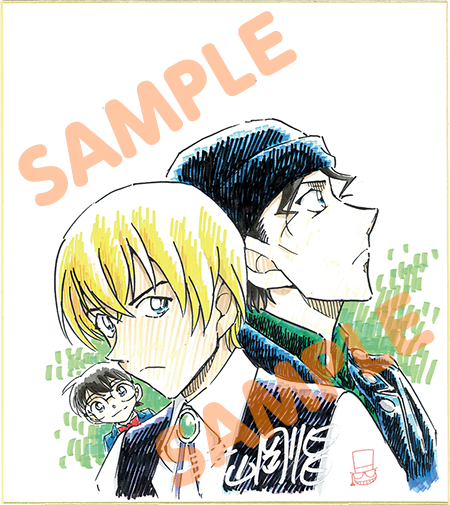 I am not saying I am with it or against it though , amuro and haibara being a brother and sister while he and akai are cousins is cool but I am still against the idea of a characters complexed relationships fully based plot. I don't see any error in anything you said in this thread. 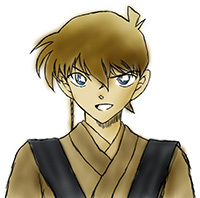 When you mentioned the interview, DCU and I just were posting the quote from the interview thing (I forgot to copy the english over into my first post) and then side tracked about Amuro himself and Gosho's coloring. No, keep at it! You're doing just fine.